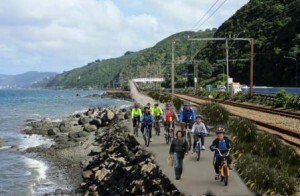 As part of preparatory work for upgrading the Petone to Ngauranga cycle path, NZTA are carrying out a survey of current and potential cyclists. They are particularly interested in people who do not currently cycle between Wellington and the Hutt, but would, if the right facilities were provided. “The NZ Transport Agency is seeking current or potential cyclists to fill out its survey about cycling between Hutt and Wellington. Please take the time to fill out our short survey (no more than 5 minutes). In addition to gaining data from the survey, we are keen to recruit a broad cross section of cyclists who currently, or might in future, cycle between Hutt and Wellington and who would be interested in taking part in evening focus groups to determine what type of cycling facilities stimulate changes in route choice and cycling behaviour. Once we have a number of surveys returned we will identify participants for focus groups and contact them, so it is very important that anyone willing to participate leaves their contact details. You would be rewarded for your time. In its submission on the draft long term plans of the Regional Council, Hutt City, and Wellington City, the Great Harbour Way Trust asks that the Councils, with NZTA and the Trust, form a working party to coordinate the upgrading of the GHW route, particularly the Ngauranga-Petone cycleway upgrade and the Eastern Bays Walkway. I have been provided with a copy of the Great Harbour Way Coalition’s submission on the 2012-21 Draft Long Term Plan. I agree with their submission and would like to record my support for their initiatives. 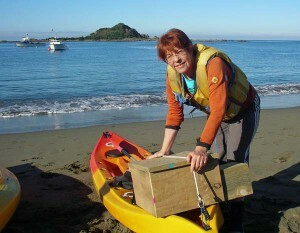 Mayor Celia Wade-Brown about to kayak out to Taputeranga Island with a penguin nesting box. One of the features of Leg 7 of the GHW is Taputeranga Island, its low peak dominating the view from Island Bay with fishing boats swinging at anchor. One of its less known roles is to offer a safe haven to the little blue penguins who populate the Wellington sea. To celebrate Earth Day, a group of kayakers paddled out to Taputeranga, taking out some commodious nesting boxes, replenishing bait stations which reduce the predator risk, and removing the rubbish blown across from the mainland. 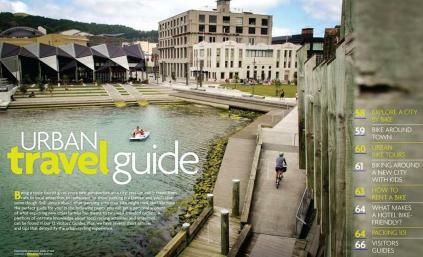 A recent edition of Momentum, an international lifestyle/bicycling magazine, featured a an image of the Wellington Waterfront section of the GHW in its Urban Travel Guide. 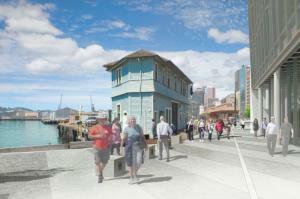 The section of the Great Harbour Way/ Te Aranui o Pōneke at north end of the Wellington waterfront is due for a major change if Wellington Waterfront Ltd’s proposed Kumutoto Plaza goes ahead. The proposal is for a five story building north of Whitmore St, with an open plaza on the ground floor. Will the development improve the GHW through this point, or will it create another Shed 5 style “pinch point”?